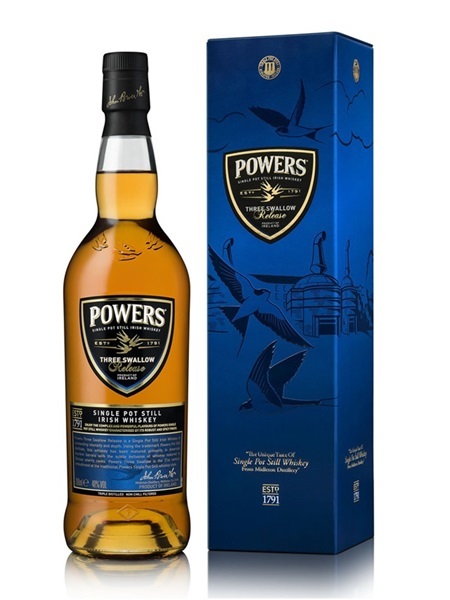 Powers Three Swallows Release (~€45) is Midleton's low end Single Pot Still offering. Pot Still whiskey has a mash bill of both malted and unmalted barley, which is unique in the whiskey world to Ireland. The Pot Still style of whiskey came about as a result of malt taxes introduced in the 1600s. It gives the whiskey a lovely mouth-feel, almost oily with subtle hints of menthol. Triple distilled, the result is very smooth. Powers Three Swallows Release is non-chill filtered, yet unusually bottled at 40% ABV.